Ricotta is the king of Sicilian cheeses, although it should not technically be called a cheese at all. “La ricotta non è un formaggio, ricotta è ricotta.” Ricotta is just ricotta. About 90% of ricotta made in Sicily comes from sheep’s milk, except for a small part of the island that makes it from cows milk. 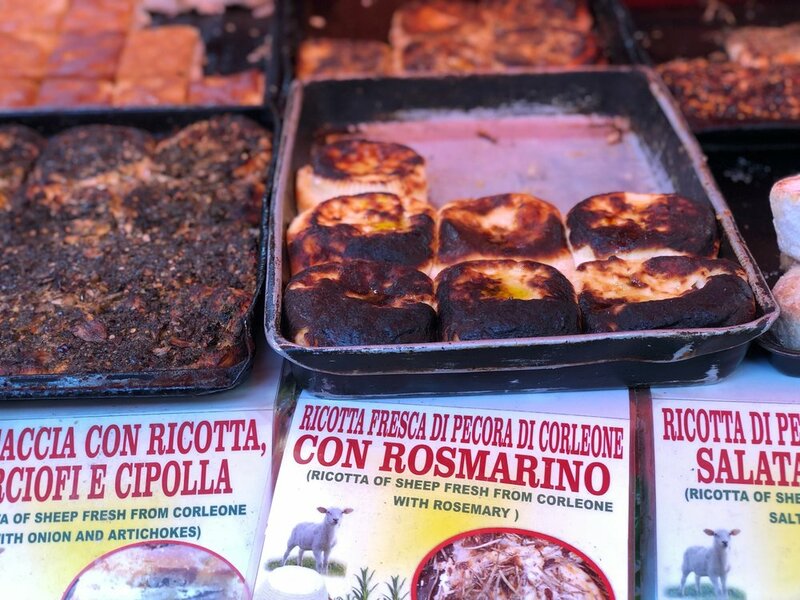 One of our favorite prepared foods to pick up in the market is “ricotta al forno.” This baked ricotta is slowly cooked in a low temperature oven for about an hour before being served on trays to the masses in the outdoor markets in Palermo. Every morning, trays are displayed in the Ballarò amongst piles of Sicilian cheeses like pecorino, ricotta salata, fresh containers of ricotta, provola, and caciocavallo. There are several varieties of ricotta al forno depending on the toppings you add before cooking. There is a traditional version with only a drizzle of olive oil, others that are covered with Sicilian oregano, a typical Palermitan sfincione topping of tomato/breadcrumb/anchovies/onions, the fan-favorite: pistachio with orange marmellata, seasonal varieties like caramelized onions + artichokes or traditional with dry herbs and spices like rosemary, thyme, spicy red peperoncino, and black peppercorns. 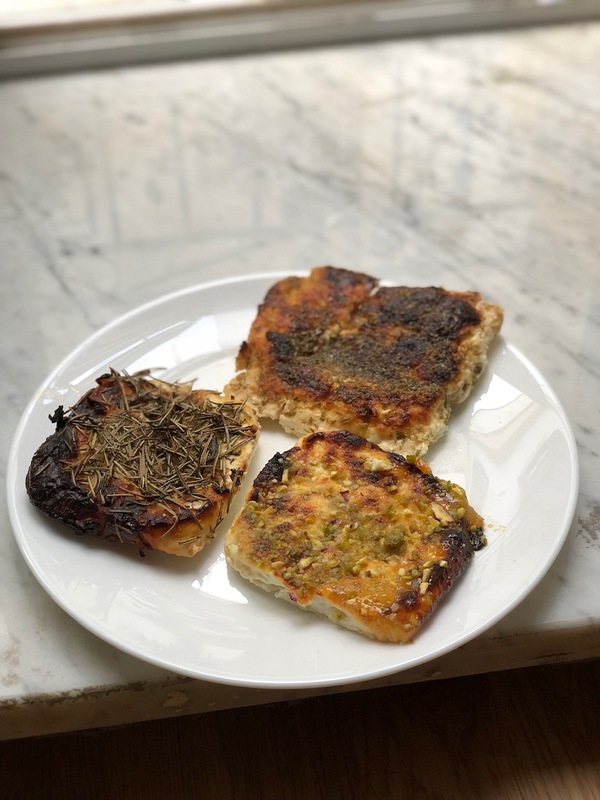 We like to serve ricotta al forno as an antipasto with crostini and a fresh drizzle of extra virgin olive oil or it can be used as a condiment inside of a sandwich. Here is a recipe to make ricotta al forno. The plastic strainer that the ricotta comes in helps keep a nice basket shape and allows some of the liquid to run out through the small holes. Flip the fresh ricotta out of the plastic container and let it rest in a bowl for about an hour to air dry and release some additional liquid whey. In a small bowl, prep your toppings, add a pinch of sea salt, and set aside. Line a baking sheet with parchment paper and place the ricotta in one piece onto the tray. Cover the ricotta with a small coating of extra virgin olive oil and then press in the herb topping along the top and sides. Bake at 180°C / 350°F for 1 hour. The ricotta will harden and become a bit more compact with a beautiful overall toasted brown color. Allow it to cool slightly before cutting into it.